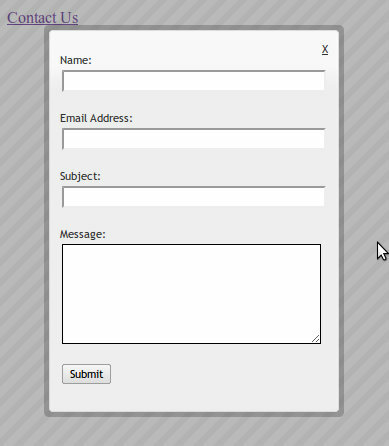 If you don't know how to make HTML form then follow part 1 of this tutorial: HTML Contact Form. If you already have working form and you need to Ajaxify it then you can skip the part 1. But this tutorial uses the form from that tutorial. Pick a theme or make your own and download it: jQuery UI. There is a part called "Overlay and Shadow Classes", that box is where we are going to put our form in. Get it with all features, meaning that check all the checkboxes. If you modify the form you might have to play with the style attributes, also if you get other style(I picked UI Lightness). Here is how I made a nice little closing button. It's the HTML in our script. And that's it, there are more cool features in jQuery UI. Like CSS buttons for example. 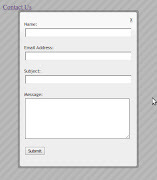 If you are using CodeIgniter then you can combine this tutorial with "CodeIgniter AJAX Form Submission With jQuery" and you will get fully functional contact form with ajax.